Well the battle continues, sorry for the delay in the post, the blizzard in the Northeast US messed up my morning yesterday and I had to work in the afternoon. I got a few turns in on Boxing Day and few more this morning, have to work again this afternoon, so a quick post. Rafa made me realise in my last post that I was making an error describing the number of turns. I was undercounting by one half (I was counting 1 turn as 1 French and 1 Allied move). Thus, I had completed 14 turns in my last post rather then 7. This was the equivalent of almost 2 hours of real time, so I should of brought my reinforcements in later then I have done. This is a trial run though, so it is good to discover errors now. I had been trying to schedule the reinforcement entries in an historical accurate way using Adkin's book. So anyway, I have completed 22 turns now and the battle is raging. 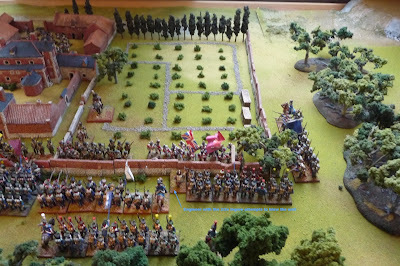 All of Baudin's brigade has now entered the killing ground in front of the orchard. They are taking casualties, as are the Nassau. An engineer from the 3/2e legere set a demolition charge and was successful in causing a breech in the previously impassable wall. It is now possible for the French to charge! The Hanoverians are taking significant casualties and although they are irregular they continually fail DISC tests to change formation and are having difficulty withdrawing. The light companies of the Guards appear to have no such problem and are withdrawing in orderly fashion north being covered by the Coldstreamers. 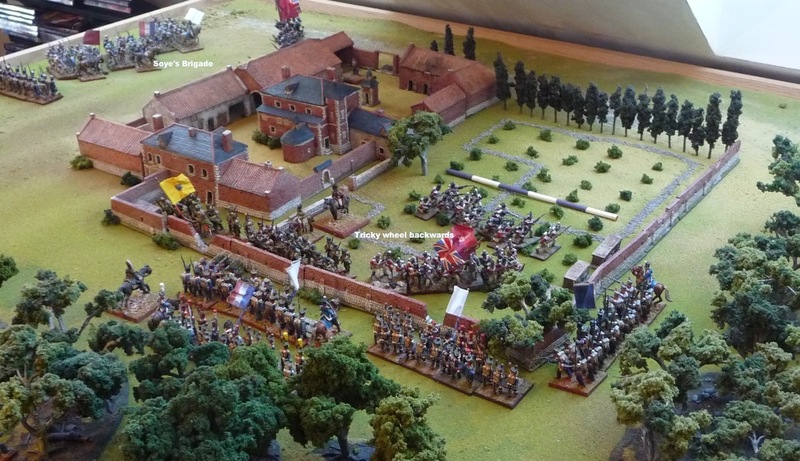 The 3/2e legere charge through the breech, the Nassau fire in reaction and the large battalion destroys the already decimated French battalion. Other French battalions move into to continue the attack. The Hanoverians take fire from Soye's brigade and are destroyed. Jamin's briagde starts their advance, the engineering company attached to the 1/4e legere is moving forward. The 2/3rd Guards advance to the southern wall to support the Nassau, who now have suffered 50% casualities. Lets hope McDonnell can throw some 6's. The light companies enter through the north gate with Col Saltoun. I have run 14 turns and so far things are going quite well. The only real problem is that the time element is way off. Generally each turn is supposed to represent 15 minutes of real time, after 7 turns though the 2e légère is just approaching the wall. This is ok, but the reinforcements are arriving too early. I suspect the increased ground scale is throwing off the movement scale. Here we see GdB Baudin giving orders to chef de bataillon Le Vol (2/2e légère). Colonel Maigrot can be seen to the right exhorting the 1/2 légère to enter the wood. The French advance toward Hougoumont through the wood. 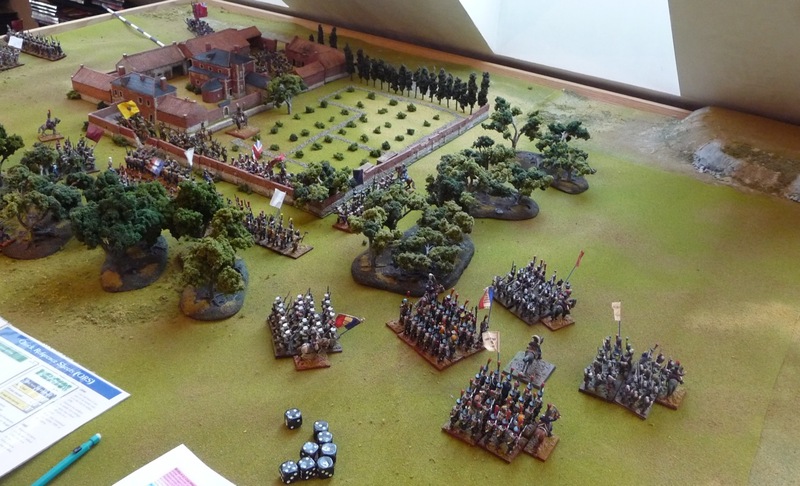 The Hanoverians in the wood start to pick off the advancing french skirmishers. There irregular status and their SK advantage work to their benefit and the 1/2e légère suffer the first casualties. 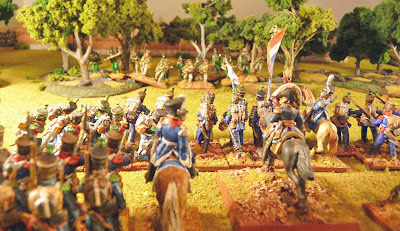 The voltiguers have to retreat. The 2,3,4/2e légère advance and the Hanoverians withdraw. The light companies of the Guards advance to cover their retreat. 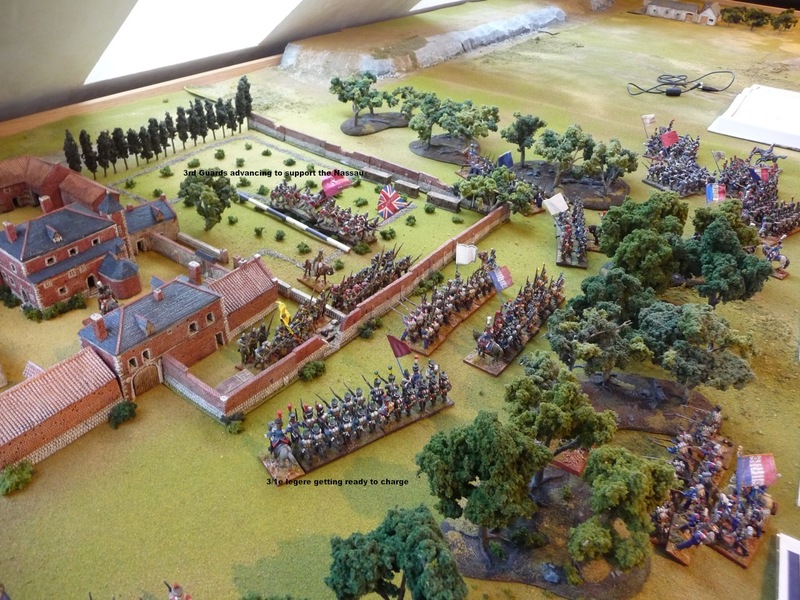 Soye's Brigade advance, it looks like the Guards light companies and the the Hanoverians may get caught. The Hanoverians turn and attempt to cover the retreat of the the British. 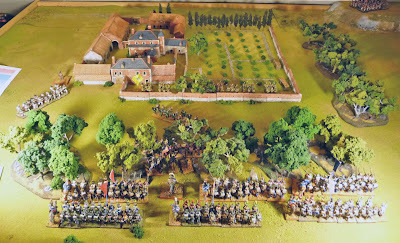 Lord Saltoun watch as his irregular troops attempt to extract themselves from the the French advance. The 1,3/1e ligne form line and fire into both the British and Hanoverians. 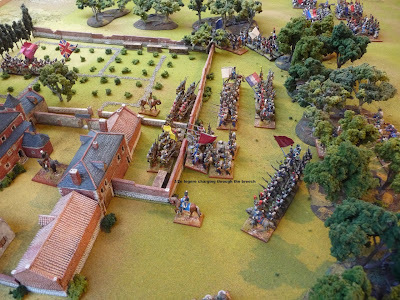 The British maneuver into line and start to retreat around the south west corner. It looks like the Hanoverians may be caught! The 2,3,4/2e légère advance into the killing ground. 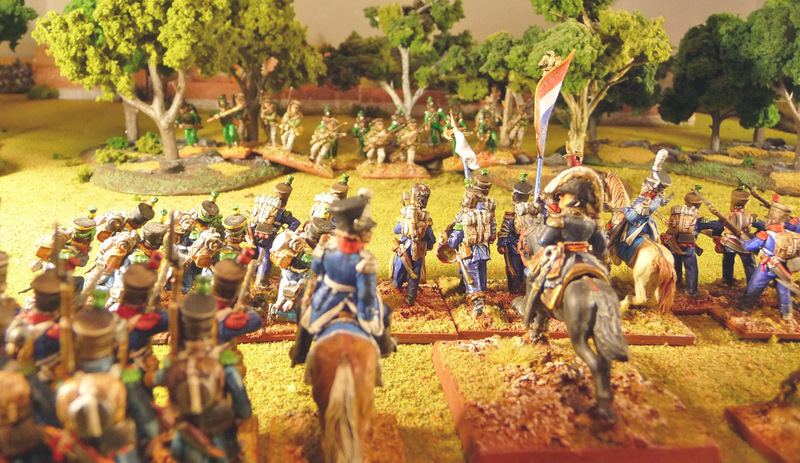 The Nassauers fire a volley but cause no casualties. 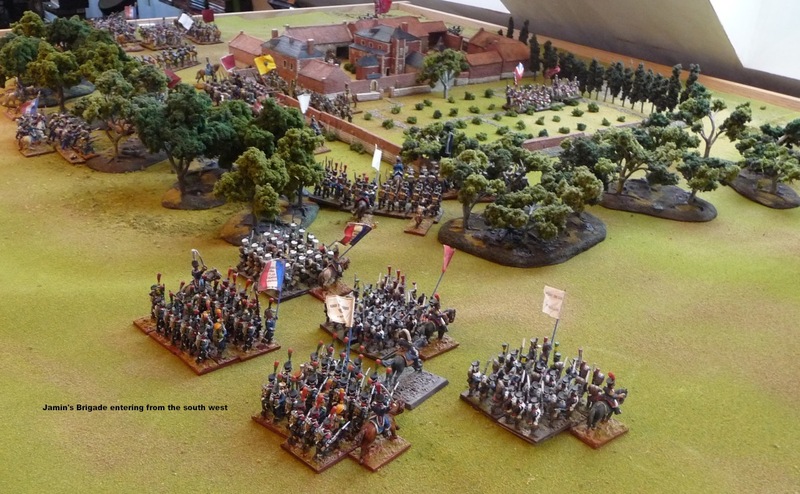 The 2/Coldstreamers form a line to protect the retreat of their light companies and hopefully the Hanoverians. Positions at the end of turn 7. Well fun so far, I will continue to run the scenario as planned, but some problems have been identified. I probably need to change the turn entry of the reinforcements. I am also going to have to reconsider what units can enter the ZOC. As noted in the introduction, I felt only a brigade could attack the complex at one time. I envisioned this to be units from only 1 brigade at a time. As you can see the forward elements of both Baudin's and Soye's brigades reached the ZOC at the same time. I had to hold back the lead battalions under Soye. Maybe, I should have made it that 6 battalions from any brigade can attack at one time. 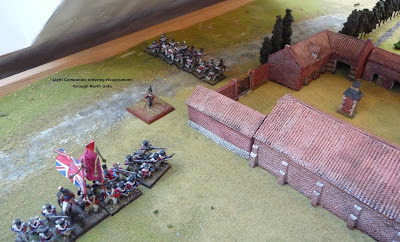 Of course if I changed the turn entry of Soye's brigade this may of not been a problem. Any comments? Well time to celebrate Xmas and start cooking, I have to figure out how to cook duck and make a trifle. Hope to have another report for Boxing Day. Happy Xmas to all. 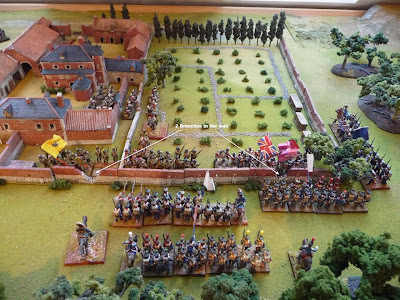 About 3 months ago on the Lasalle Forum, there was a discussion about how to organise a scenario for Hougoumont, Napoleon's left flank at the Battle of Waterloo (or I suppose alternately Wellington's right flank). For some reason, about which I am still unsure, I was quite attracted by the thought of doing this scenario. I had almost enough French battalions and I was in the middle of painting some Hanoverians, so I said why not! I spent quite a lot of time researching the action, a lot of information was out there. I found the internet somewhat contradictory, so I bought a couple of books; first Pagets's monograph on the action and then Adkin's authoritative book on the battle. The latter is really a most excellent book. A quick inventory of my army showed that I could accurately do the OB with what I had, as well as needing to paint 4 more battalions of légere, a few command figures, some Hanoverian skirmishers and finally a battalion of Nassau. 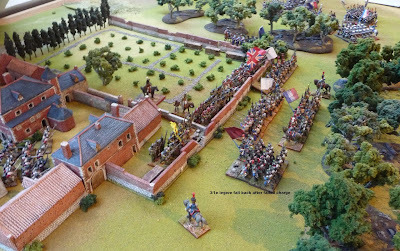 Knowing the importance of the look of the thing, I also knew that I would have to acquire some terrain, namely Hougoumont itself. 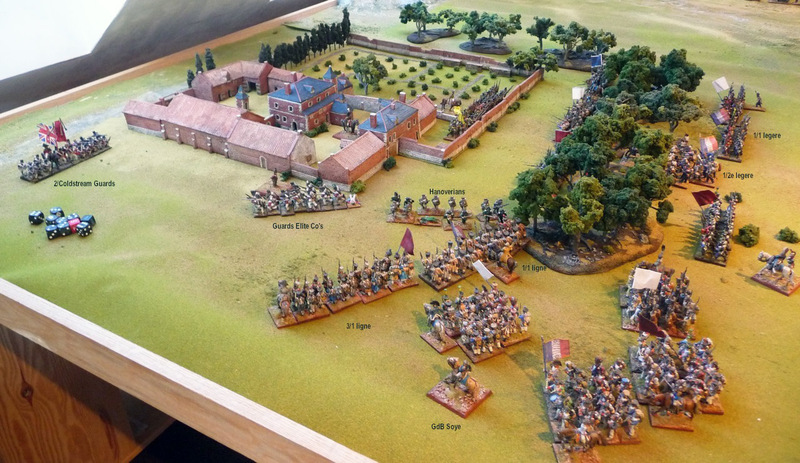 I have a 12'x5' table, so I felt a small action like Hougoumont was quite possible. Piece of cake, I said to myself, I can do that all in 3 months, as my plan was to run the scenario in the week before Xmas. 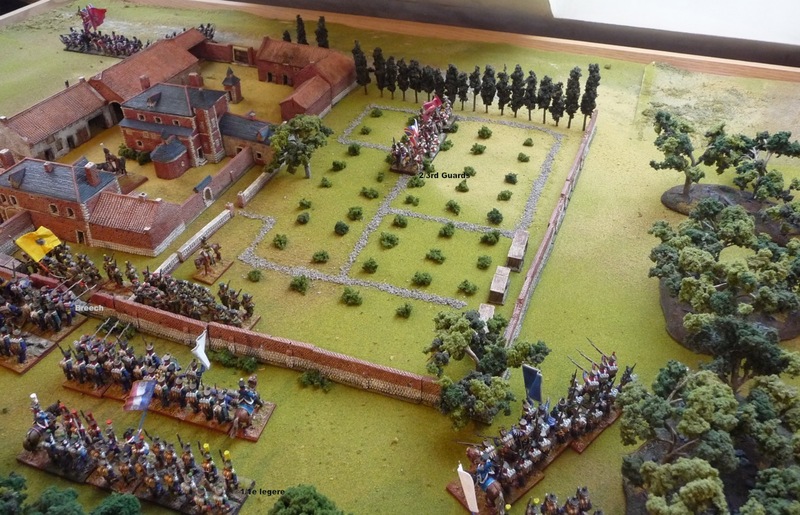 Indeed, once I did some measuring I felt I could also run the La Haie Sainte scenario at the same time. Luckily, I controlled myself (the thought of having to paint 3 more battalions of légère also helped), and restricted myself to having to paint around 140 figures and the buildings in less then 3 months. I am going to use the Lasalle Napoleonic rules for my first go at the scenario. Order of Battle: The OB I am using is pretty accurate, and covers the first 3-4 hours of the action. I have had to make some slight adjustments to the number of men and I also slightly varied the OB for Jamin's brigade. The light German infantry and light companies of the Guards companies are slightly over represented while the remaining number of men in the 2nd battalions of the Coldstream and 3rd Guards are under represented. In respect to Jamin's brigade I have increased the number of ligne and decreased the number of légère, just could not paint any more légère. I have left out the other brigade (Tissot) in Foy's 9th Division and I have not included Bachelu's 5th Division. For my first go, I also left out cannon on both sides and Pire's cavalry brigade. 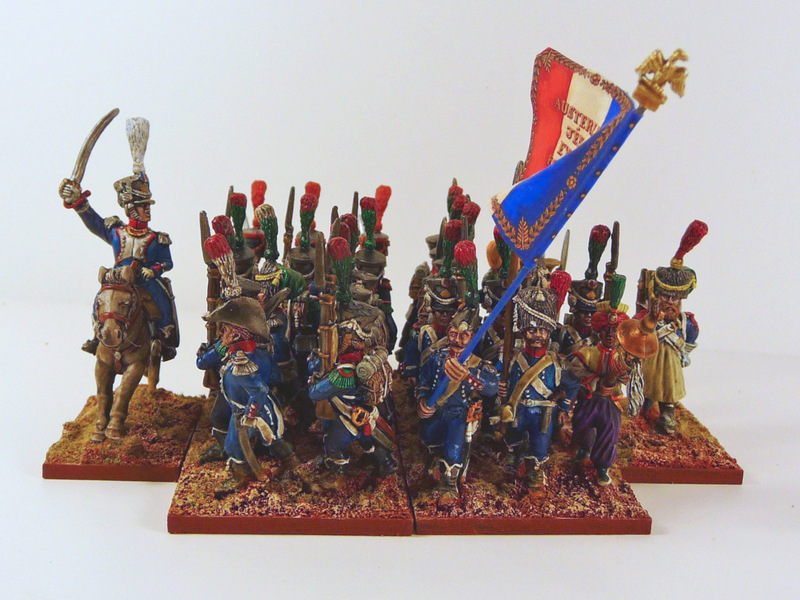 I have used standard Lasalle ratings for all the French, I do not believe the 1,2,4e légère can be rated elite troops. I increased the SK value for the Nassau, I would think that this specific battalion stood above most of the other Nassau. I have made the light companies of the allies irregular, I believe of course they would have fought as such, and the 1/2e légère are also irregular. They represent all the skirmishers sent forward in Baudin's brigade. The French sub-commander rating have been diced for, I have made MacDonnell a superior commander and Saltoun a good tactician and vigorous commander. 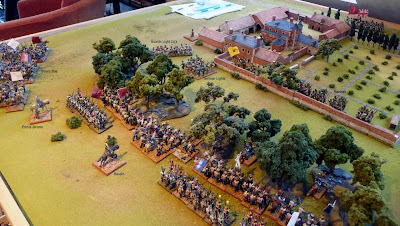 Three engineering groups have been attached to the French, maybe a little much, but in this first playtest they have one less infantry brigade, we will see how it goes. Soye's Brigade enters in Attack Column at the southwest corner. The 2/Coldstream Guards enter in March Column at the north corner of the complex. The Terrain: I have used the Hovels 15mm model to decrease the already too big footprint. I believe the final ground ratio for the model ended up at 5 cm to the metre (I am very poor at these types of calculation, so I am happy to stand corrected). As you can see, this is way out of proportion to my battalion scale (16 cm in line). Thus, I really can not use the concept of Lasalle BUA (1 BUA equals 3 BW) as laid out in the rule book. 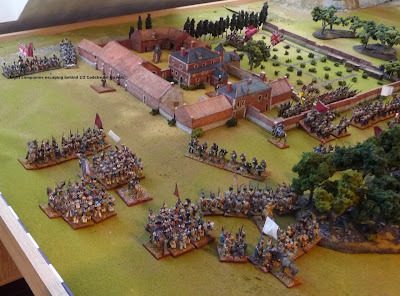 I looked around for some ideas and found that Barry Hilton in his Republic to Empire rules has a completely different approach to BUA. He essentially ignores the size of the model (the footprint is always going to be too big) and accepts that the important thing to many gamers is the look of the game. I like this! He looks at a BUA as how many models can occupy it and how many models can attack at one time. Using the table from this ruleset, I felt that it was reasonable that the maximum number of models that could occupy the walled Hougoumont complex at one time was essentially no more than a battalion, that 1-2 battalions could occupy the formal gardens and that no more than a brigade could attack at one time. This sounded quite reasonable historically if you think about it. He also imposes a zone of control (area which is barred to non attacking units) around any BUA which in Lasalle speak is going to be approximately 6 BW. So much for that, otherwise I am really going to try to stick to the Lasalle rules as written. The complex and the walls around the formal garden are impassable, but the gates and the walls can be destroyed as noted in the scenario specific rules. The walls are all hard cover. Movement within the complex and the formal garden is unrestricted and all units are in the complex are in the town deployed formation, but in the garden are regular formation. The 2 internal gates within the complex are not impediments. Movement out of the complex and through outer gates is in march formation. Woods around the complex are defined as rough terrain and soft cover. Scenario Specific Rules: As noted above, I really want to play the rules as written. Entry of reinforcements will be turn dependent and the French will not be allowed to attack with more than a brigade at a time as noted above. As far as I can tell now, I will be using the Optional Rules for Officers Tactics and Casualties, Irregular Units (Hanoverian, British elite companies, 1 French légère), Half Battalion Deployed (British Guards), Superior Commander (McDonnell), Irregular Units Recovering and Engineers. The only variation in these Lasalle optional rules is that in the Engineer demolition rule, the walls around Hougoumont and the 3 gates can be demolished. The wooden gates will be treated as the equivalent of a wooden bridge so an engineer may re-roll a failed attempt. The engineering bases are attached to specific units and can only carry out a demolition task. They do not utilise their assault enhancement. They are removed if the infantry unit to which they are attached is destroyed or when they carry out a demolition task. The game will end when one side fails it's Morale test. Well, I hope, I have covered everything, we will just have to see how it goes. Initial Deployments, as from Adkin. 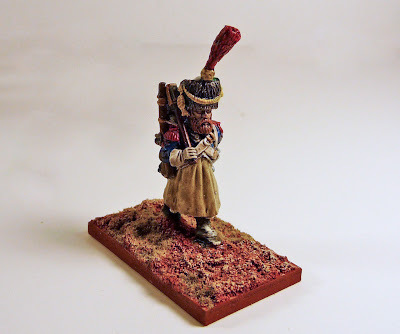 The final unit for my Hougoumont scenario, flagged as the 13e, but will do service as the 4e. Beautiful Front Rank figures, but probably a somewhat dated uniform for 1815. Lots of special figures thrown in including a drum major, sappeur, and a brightly coulored musician with a jingling johnny. The 3 carbiniers were painted by someone else, who I have now forgot! 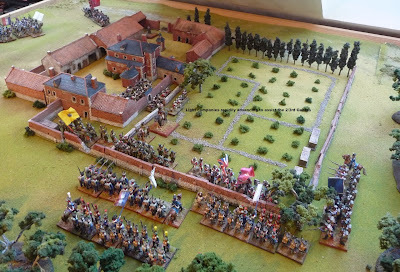 Anyway, the Struggle for Hougoumont will commence within the hour........stayed tuned! 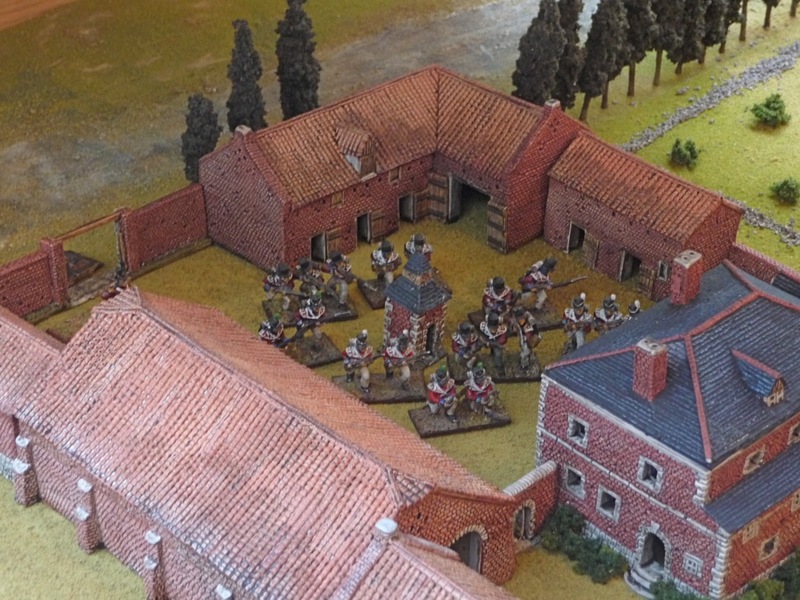 Well it took me about 5 weeks, but I finally got the Hougoumont complex completed. When I got tired of painting figures, I found it a nice relief to paint the Hovels 15 mm buildings. It was a pretty simple paint job, but I believe pretty effective. Probably never spent more than 10-12 hours actually working on it. I sprayed the buildings white and then used thinned acrylic paints as a medium wash. Only used 6 colours, all Citadel: Tanned Flesh, Dwarf Flesh, Fenris Grey, Charadon Granite, Knarloc Green and Gryphonne Sepia. The AP Darktone was applied, followed by a dry mat. I did touch up some of the white with a white dry brush. The total complex, including the formal gardens is about 63x74 cm. The actual complex with the full size formal garden was around 120x225 metres. I cut the length of the formal garden by half, historically it was more then twice the size of the walled compound. I believe this gives me a ground scale of approximately of 5 cm to 1 metre. Looking from the southeast, you can see the barricaded south gate, as well as the "killing ground" south of the formal garden wall. Looking from the northeast at the barricaded north gate. The northern part of the formal garden had an hedge rather than a wall. Looking from the southwest. The complex itself was surrounded by a small forest that was actually about 3-4 times of the depth of the complex itself. There was also extensive orchards to the west of the formal gardens. These are underrepresented or not represented here. The tree stands are from Architects of War.